What a beautiful reception hall! 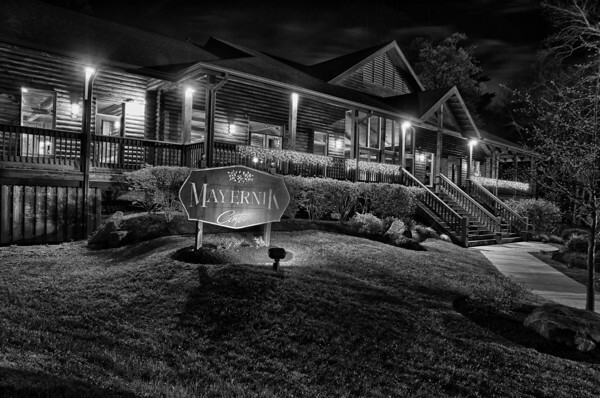 As the night was winding down, I grabbed a few images of the beautiful Mayernik Reception Hall. The lights glowed beautifully in the night and there was a very faint light coming from a cloud covered moon. Both views were taken with the Nikon D300s and the Tamron 17-50 utilizing five bracketed stops to create the image. The second image was completed utilizing Nik Silver efex pro 2 and Nik HDR efex pro. Personally, I like the look of the black and white version but that is because I like the soft tones created in the black and white. Either way, I had a great time creating and designing the images. This is an another example of a beautiful place within an hour drive from my house. A few tips: Typically, I have a tripod in my vehicle at all times. I have a day backpack that I carry one camera body, a few memory cards, 17-50, 35mm, and 70-300vr. I recommend carrying your camera with you at all times. Carrying a tripod might not work depending on what else you have in your vehicle. These images were taken at the end of the night after a wedding. The wedding was at Victory Family Church and the reception was at the Mayernik. Let me say that you are a really good photographer. How long have you been working in this filed? And what is your favorite tool for editing photos? Mine you can see on this website.